So Lonely in Gorgeous: Always Coca-Cola...Tasty Related, Not Beauty Related! Always Coca-Cola...Tasty Related, Not Beauty Related! I'm a Pepsi girl, btw, and can I tell you how hard it is to find regular Pepsi in Japan?! And, I'm not talking about Pepsi Next Zero or whatever it's called (gosh, I can't handle diet soft drinks; they give me migraines). Anyhow, I wanted to show you the neat packaging of this Coca-Cola tin bottle. I'm nor sure if this is new, or not...for all I know, it's been around for years, and I just got around to finally noticing it. 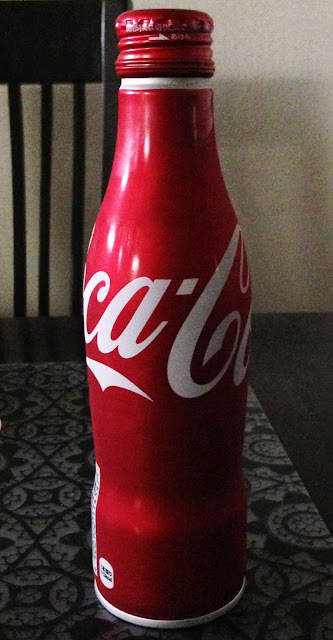 Have you seen this tin Coco-Cola bottle in your hemisphere? I think I had Coke Zero for the first time in Japan and remember how amazed I was that it was pretty tasty! I am a full on sugar person, but if I can't find regular, I'll happily drink that. My philosophy is if I'm worried about baddies, I'll just drink water. Ok, first of all, your parcel looks uh-mazing! Secondly, your Suqqu post and look are glorious, as always, and so is your post on the Addiction shadow collection. I love buying makeup online, and I think part of that is the fact that I love receiving packages in the mail. I'm in LOVE with Suqqu Summer, and I'm hoping for better weather, so I can continuing my swatching my Addiction shadows. Sorry, but I <3 you. Maybe one day we can go shopping together. Funny, because when I lived in the states, I rarely drank sodas. But, in Japan (especially during Summer), I drink more of it. Btw, I don't drink coffee or alcohol...I guess my taste buds never matured or something. Oh, btw I saw on the news that Japan is going through one of the worst heatwaves in its history...Is everything ok? Hopefully we can meet up one day. I do have family in Greece, and I've always wanted to visit. Oh my gosh woman, the weather has been pure HELL! It's so hot and humid, it's just criminal. It's so hot that I turn cold water on and it came out warm. People over here don't use A/C, and department store have the a/c set to humid. Seriously, if it's 32°C, they have the A/C at 31°C...ridiculous!!!! I have family in Athens. Although still hot and humid, the weather has been overcast or rainy. I can't swatch anything! Wait, we need code name!